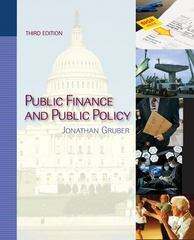 Public Finance and Public Policy 3 Edition When it first appeared, Jonathan Gruber’s Public Finance and Public Policy was the first textbook to truly reflect the way public finance issues were evaluated, implemented, and researched in the real world today. Like no other text available, it enhanced its survey of essential, traditional topics with an emphasis on empirical work and coverage of transfer programs and social insurance. Coming in the wake of the 2008 financial crisis, the presidential election, the 2009 stimulus package, and ongoing debates over financial reform and health care reform—Gruber is the author of Massachusetts’ universal coverage plan—the new edition couldn’t be more timely.Thoroughly updated, Public Finance and Public Policy, Third Edition brings students up to date on the important debates that are dominating today’s policymaking, giving them the basic tools they need to understand fundamental public finance issues now and in the future.